Gordon Brown's decision to sack 40,000 civil servants to fund schools and hospitals is being seen as effectively beginning the next election campaign. The Conservatives say the chancellor's Budget package means taxes will have to go up if Labour wins a third term. But Mr Brown says Whitehall job cuts and other measures will save £20bn. He denied that by focusing on civil service cuts he was attempting to steal the Tories' and Lib Dems' thunder ahead of an expected election next year. He said the job cuts were the result of the Gershon review, "which we started more than a year ago" and the planned merger of the Inland Revenue and Customs and Excise. The cuts would take effect over the next four years and would mostly come from "back office" functions and the use of new technology, he said. In a series of BBC interviews, Mr Brown said he had chosen to invest in schools and hospitals rather than cutting taxes. Shadow chancellor Oliver Letwin told BBC Breakfast he welcomed Mr Brown's plans as it meant there would be a clear choice between Labour and Conservatives at the next election over potential tax rises. 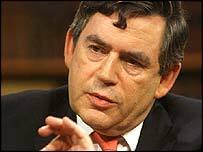 He said: "Gordon Brown has shown that he had nothing to say except that he wanted to spend your money. "For the first time in a long while, we have got the Labour Party back clearly admitting it's a tax and spend party." BBC political editor Andrew Marr said Mr Brown's Budget speech could have been made "three weeks away from polling day". "The crucial thing politically is trying to create the impression that there is a wide area of water between what Labour will do over schools and hospitals and what the Conservatives will do." But on Thursday afternoon, Prime Minister Tony Blair told reporters: "If people say it is a ballot box Budget, what they mean is it is a popular Budget." Mr Blair was visiting a north London school with Mr Brown, in a post-Budget show of unity. BBC Economics Editor Evan Davis said the chancellor would need massive reforms if he was to meet his hope of going from efficiency savings of about £1.6bn a year at present to £20bn a year. Meanwhile, Liberal Democrat Treasury spokesman Vincent Cable is accusing Mr Brown of ducking tough choices on the economy until after the election. Nothing had been done to address "very serious imbalances" in the economy, such as the high levels of consumer debt and the over-inflated housing market. In his Budget speech, the chancellor said he was freezing a range of taxes and claimed the UK was enjoying its longest period of economic growth since the Industrial Revolution. But he admitted the government was borrowing £37bn this year - £10bn more than he predicted a year ago - and that borrowing would remain high for some years to come. What has he actually done here to help the average taxpayer? As well as the 40,000 job cuts, Mr Brown unveiled plans to relocate 20,000 civil servants from London to the regions. But his announcement provoked an angry response from civil service unions. Mark Serwotka, general secretary of the Public and Commercial Services Union (PCS), said: "Being told by the chancellor on TV that you have lost your job is as bad as being sacked by text." He later met senior Cabinet Office officials but said he had received no further details of the plans and was dismayed compulsory redundancies had not been ruled out. Jonathan Baume, from the First Division Association, said having political parties trade figures over civil service jobs was not a good way forward. Work and Pensions Secretary Andrew Smith said letters had gone to staff as soon as the announcement was made, although it had already been known modernisation was planned. "It's job changes over the next four years"
Anyone for a game of chess?